How old were the Founding Fathers: The leaders of the American Revolution were younger than we imagine. A list of ages of important American Revolution characters seems elementary enough, and certainly easy to assemble, yet I wasn’t able to find such a list anywhere I looked. And I don’t recall ever stumbling upon such an appendix while researching my book, so I figured I’d just make one. This is a list of ages, from youngest to oldest, of key American Revolution figures, providing their age as of July 4, 1776. 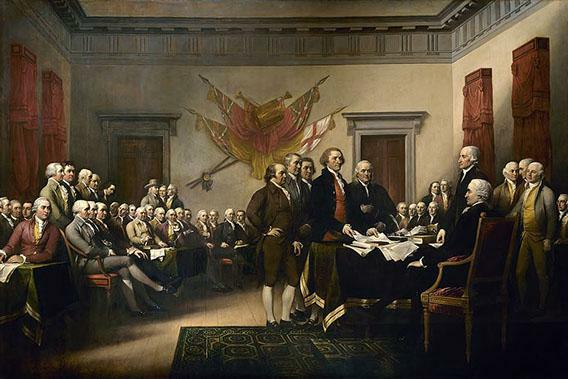 An asterisk signifies that the individual was a signer of the Declaration of Independence. A double asterisk means that there is evidence that the person’s age is not precise, or only a birth year is known. If you spot any corrections or recommend any additions, let me know in the comments and I’ll continue modifying the original list. This piece is reprinted from Journal of the American Revolution.